This truck mattress has that “ahhh” factor you’re looking for. It’s the same as the Roadside only 3-inches thicker with premium high density and resiliency polyurethane foam. Available in standard and custom sizes. The Cross Country is our mid-level truck bed mattress. Whether it’s time for a relaxing chill session or a good night’s sleep, you’ll look forward to stretching out on this comfortable mattress. This semi-truck mattress is designed to be a perfect balance between cost and comfort with an 8-inch thick mattress and foam density of 1.8 lbs. per cu. ft. If your truck cab has the ceiling space, this mattress is ideal. 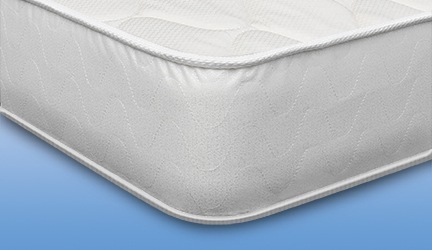 Our comfortable Cross Country mattress includes a sewn cover with a tape edge. The bottom of the semi-truck mattress cover is made from skid resistant, high-tech material. The sleeping surfaces and sides are constructed from attractive, high quality quilted damask. The Cross Country is available in a variety of sizes and lengths. 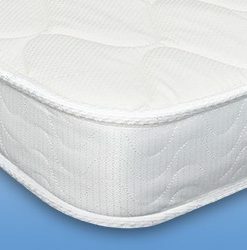 Optimized for the Perfect Mix of Support and Value—The core of this mattress is eight inches, which maximizes the amount of support offered. We live in a world where we want to believe bigger is better. However, if we made this truck bed mattress thicker, the only thing we would be doing is making it thicker and more expensive—not necessarily better..
8-Inches Thick—Gives you that extra support (5-inch base of 1.8 density support foam) you need for a comfortable, great night’s sleep and a “feel great” next day. “Medium-Firm” Feel—The Cross Country is designed for those who prefer their mattress not be too firm or too soft. This truck sleeper mattress is firm but not as hard as sleeping on a carpeted floor. You can make it softer by the addition of a soft topper pad— nothing like a little versatility. Heavy Duty—Construction counts when you want a truck mattress to work as hard as you do and last as long! The inside of your truck can get a little rough and tumble and there can be temperature changes depending on the season. 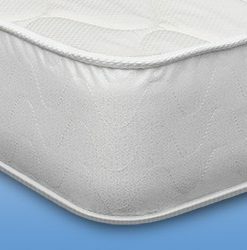 Our mattress ticking (the cover), the high density of our foam, and our “tried and true” construction methods are designed with durability in mind. Made in the U.S.A.—The Cross Country is custom crafted in our NJ manufacturing facility in about a week, often less. Delivery is fast and shipping is free. Made to Accommodate Multiple Truck Manufacturers—The Cross Country mattress fits perfectly in any truck brands, including Kenworth, Freightliner, Peterbilt, Volvo, Ford, Mack, , Sterling, and Western Star.